Hornady scored a win in innovation with the eXtreme Terminal Performance (XTP) bullet. 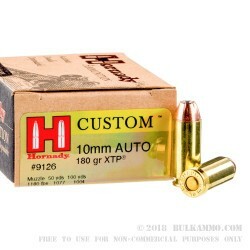 This 10mm auto ammo features 180gr jacketed hollow point (JHP) XTP projectiles shaped by swaging to achieve near perfect weight distribution. This design technique coupled with their AMP bullet jacket helps achieve flat trajectories, heightened accuracy, and immense stopping power as a result of its explosive expansion. 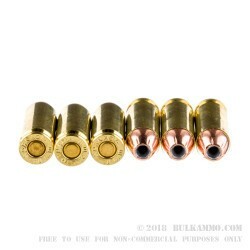 These bullets are designed to expand regardless of velocity, so you can protect yourself from any distance. 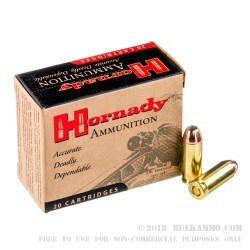 Though this 10mm ammo is highly effective for self-defense purposes, its performance also makes it suitable for hunting and target shooting. 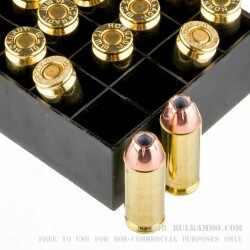 These premium self-protection cartridges are brass-cased, Boxer-primed, and non-corrosive. The casings are reloadable.